Former Asian Tour player and P.G.A. Professional John Wither (pictured right) welcomes you to the Hua Hin Academy of Golf. 5) Fully licensed restaurant "PEPPERS"
The location of the Academy of Golf is 5 minutes from the center of the town of Hua Hin; taking the road over the railway in the direction of Majestic Creek and the Elephant village. The range is 3 kilometers from the railway tracks on the left hand side. Golfers of all levels can come here to hone their skills under the watchful eye of John Wither. Private or Group Lessons provide the golfers of varying desires and abilities with the knowledge to maximize their potential, understand the game better and importantly understand their swing. John Wither is the Director of Instruction at Hua Hin Academy Mongkol driving range. John started his professional life at St Pierre Golf and Country club, Chepstow, Wales in 1989 after which in 1993 he started out on his playing days becoming the 1993 Scottish Assistance Champion and that same year the Assistants Order of Merit champion. 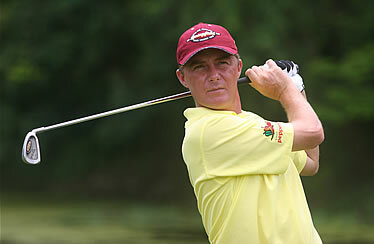 1995 saw him competing in the British Open, and the winner of The Autumn Classic in Scotland. In the following year he was the Coca Cola China Open Champion, Volvo China Order of Merit winner and semi-finalist Volvo Asian Match play Championship. From 1997 until 2005 he was the Director of Golf at Golf and Land Hotel, Balmer See, Insel Usedom, Germany, overseeing all areas of the golf club and course, being fully responsible for the coaching and day to day running of the facility. 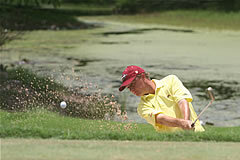 From 2005 he became a playing member of the Asian Tour. Beginners: Start on the right track. Learn the very important basics of the golf swing in a fun and relaxed atmosphere. 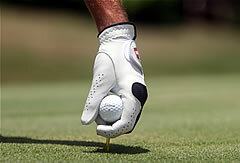 Handicap golfers: Improve your ball flight by means of a more fluid golf swing resulting in longer straighter shots. Advanced golfers: Fine tune any aspect of your game under the watchful eye of our P.G.A. qualified instructors. Juniors: It’s never too early to start, short lessons available for the aspiring youngsters. Let them have fun and become involved with the game. Groups: Groups up to 8 can join and with The Pro organise their golf tuition to suit everyone but first best to contact John for it to be set-up and priced. 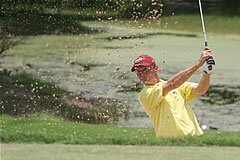 Get more details and prices on our Hua Hin golf lessons page. The Pro shop is being equipped to offer a club repair and maintenance service and it is hopeful that this will be operational by the new high season, November 2008. Already John offers as regional distributor, Cleveland, Titleist and Cobra brands and most months there is an exhibition for those wanting to try out the new clubs at the range. Dates for equipment shop to open and exhibitions will be posted in the Hua Hin Golf Gossip column on the Hua Hin Forum. Also, the Pro Shop is already being used as an ideal location to sell your second- hand clubs, an ideal place to find your first set or the odd 'one-off' that takes your fancy. 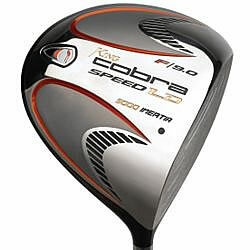 You can of course try all clubs on the range before purchase. Please note if you require transfers (inclusive both ways) mention when you book and the costs will be included, usually, Hua Hin hotels 500 baht and Cha Am and Pranburi 750-1000 baht per taxi/mini bus. Perhaps it should be noted that an average golf game can, including your transport, caddy, tips and green fee, be as much as 5,000 baht per round per person.